On the back of the plate it says "Christmas Plate Series Fifth Edition Carollers in the Snow Made Exclusively for Avon Products, Inc, 1977 By Enoch Wedgewood (Tunstall) Ltd. England". It also has a gold V on the back of the plate. The plate measures 8 3/4" in diameter. 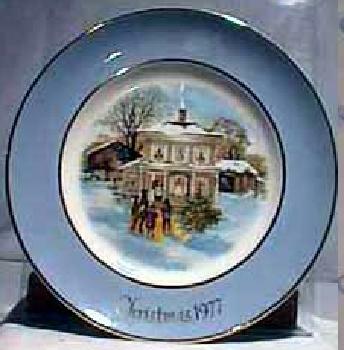 One of the first Christmas plates produced by Avon. Made exclusively for Avon Products, Inc. by Enoch Wedgewood. This piece has the box. Mint condition no chips or cracks!